With so many advances in modern technology over the years, Swift Glass is proud to announce our own revolutionary development: a newly redesigned website. We have taken extreme care in providing an updated interface, with streamlined information about our products and the industries that we serve. Whether you are an engineer, designer, or procurement manager, you will be excited to learn that we have increased our site’s user-friendliness to better improve your overall experience, and offer solutions that cater to your projects and applications. With nearly 100 years of expertise in custom glass fabrication, Swift Glass is no stranger to transformation. We’ve evolved with the times and understand that today’s fast paced, digital business climate requires the ability to access information and resources anytime and anywhere. Free, downloadable reference guides and videos available in our resource library. We are here to do the hard work so that you don’t have to. Our goal is to help you find what you need at the click of a button. If you are having trouble determining the perfect glass solution for your project, fear not. 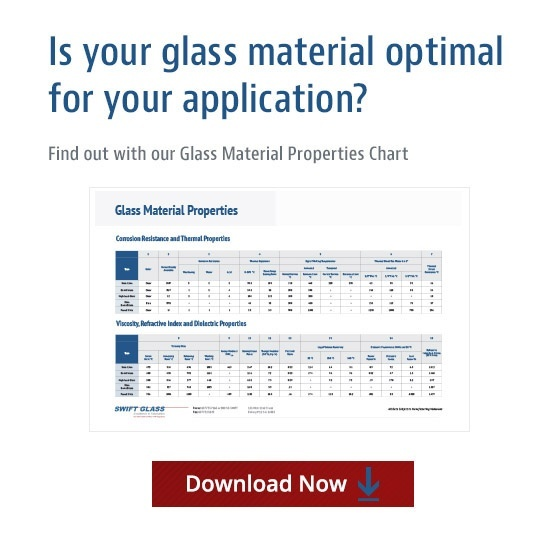 Our site now includes in-depth profiles for materials such as: Borosilicate; Patterned Glass; Gauge Glass; Optical Display Glass; Sight Glass; and; Quartz/Fused Silica. In addition, we offer a new portfolio feature that visually showcases our state-of-the-art work. We believe that jumpstarting a new fabrication task should be simple and comprehensive. Our updated website is an investment in our commitment to providing the best solutions for our customers. Visit our site today and start learning what Swift Glass can do for you.